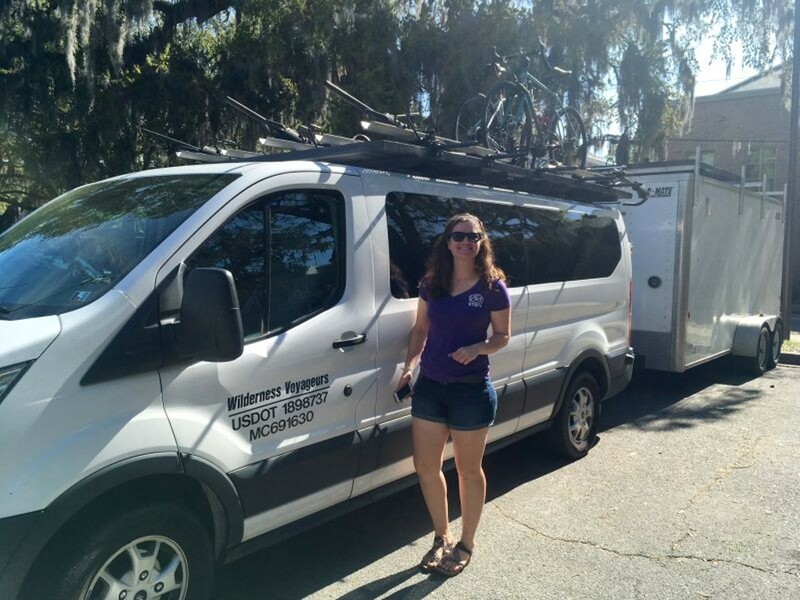 Becca, a guide with Pennsylvania-based Wilderness Voyageurs bicycle tours, brought 10 visitors to explore Savannah by bike this week. She’ll be back again next week with a dozen more. 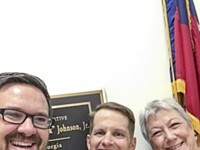 ARIANA PERNICE, vice president of the Hilton Head Island Visitor and Convention Bureau, knows a lot about the preferences of island visitors, especially when it comes to their feelings about bicycling. At the Second Annual Southeast Biking Symposium, March 22-24, she told attendees that 91 percent of visitors listed safety as their top priority when bicycling, which explains why 93 percent of visitors said they prefer using the island’s more than 100 miles of dedicated bike paths. The symposium, organized by the Hilton Head Island-Bluffton Chamber of Commerce, attracts tourism professionals, cycling advocates, planners, and government officials. 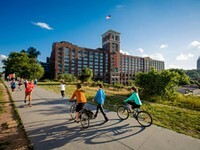 The conference focuses not only on trends in bicycle tourism, but how destination cities can use bicycling to improve quality of life for residents. Hilton Head is one of only 21 cities to earn gold level Bicycle Friendly Community status from the League of American Bicyclists and is the only gold level community in the Southeast. For comparison, Savannah and Tybee Island are both bronze level Bicycle Friendly Communities. 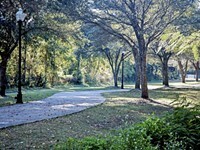 The Town of Hilton Head Island has constructed 64 miles of public pathways through its capital improvement program and another 50 miles or so of trails and paths have been built within private developments. It’s no surprise that 48 percent of visitors rent bicycles during their stays, according to Pernice, and many others bring bikes with them to Hilton Head. When a community provides a safe walking and biking infrastructure network, visitors and residents use it. It’s a pretty simple equation. Additions to Savannah’s woefully inadequate inventory of bike lanes, and multiuse paths would surely encourage more visitors to explore our city by bike. However, in the wake of the troubling Savannah National Historic Landmark District “Condition Assessment” released last week, some might wonder if we should be encouraging more visitors of any kind. Yet there’s a difference between the affluent, well-educated demographic that goes in for bicycle touring and those for whom to-go cups are the main attraction. Consider that 82 percent of touring cyclists in the United States have a college degree, 8.1 percent are international visitors, and 58 percent make over $75,000 per year. What’s more, when people use bicycles during their visits, they don’t compete with locals for parking and don’t add to wear and tear on our streets. Plus, they spend more than other types of visitors and are less likely to get into fist fights in City Market at 2 a.m.
How big is the potential for bicycle tourism in Savannah? Pretty big, if you consider the extent to which our city has emerged as a bicycle tourism destination despite the fact that no significant improvements have been made in our bicycle infrastructure in more than six years. In addition to local businesses like Savannah On Wheels and Perry Rubber Bike Shop, which offer bike rentals to visitors, national bicycle tour companies including VBT, based in Vermont, and Pennsylvania’s Wilderness Voyageurs are operating van-supported tours in our city almost year round. To understand how putting more visitors on bikes can benefit residents, consider another example from Hilton Head. When a symposium attendee complained about traffic congestion on the island, Pernice asked him to imagine what would happen if everyone who rides bicycles on the island decided to drive instead. In Savannah, the scenario would be flipped. Imagine how many cars would be taken off our streets if more visitors and residents felt safe walking and riding bikes. And that’s the most frustrating thing about our situation: Projects that would allow more visitors and residents to get out of their cars and travel on foot or on bike are often dead on arrival because of fears, often exaggerated, about traffic congestion and loss of on-street parking spaces. Our fixation on avoiding even the slightest inconvenience to drivers has prevented us from providing transportation options for people who would rather leave their cars at home. Even worse, it’s perpetuated unsafe conditions on our streets that endanger people who walk and bike out of necessity. In his March 30 keynote address to the Sixth Annual Savannah Urban Planning Conference at Savannah State University, Tom Sanchez pondered our continuing preoccupation with cars, especially when there are so many changes on the horizon. A professor and chair of the Urban Affairs and Planning Program at Virginia Tech, Sanchez reminded the audience that not too long ago, cities were similarly focused on another kind of conveyance. People once thought horse carriages would always be a primary transport modes in cities, he said. We will never eliminate the need for transportation, but we may not need cars in the in the cities of the future, Sanchez said. Right now in Savannah, we need more transportation choices.